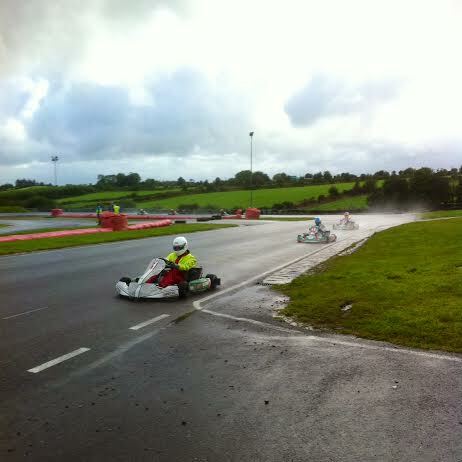 Challenging weather faced the competitors on the penultimate round of the Motorsport Ireland Kart Racing Championship in Co. Cork this weekend. Clerk of the Course Garry Manning ensured the 40 plus races throughout the day ran with minimal interruption from what was at times, almost monsoon like conditions. With competition fierce throughout the day, the first finals held were in the Cadet class where Alex Dunne took the honours in the number 12 kart in a competitive race. The Mini Max class saw Dylan Kelly win the opening final of the day but it was another Dylan, Dylan Tuite who would take home the trophy at the end of the day after he emerged victorious from the second final. Aaron O’Rouke in his 88 plate kart took the Junior Max honours while Ayrton Sherlock won the Senior Max class. If there was pressure in competing in karting, in the wet, with a name like Ayrton, it didn’t show and Sherlock produced a great drive in the second final. There was a surprise the the Super Four/Biland class where local favourite Gabriel Lodge narrowly lost out in the final to Mayo resident, Pasquale Di Lucia in a breathtaking race which hung in the balance right up to the final corner. One of the most commanding performances of the day came from Sam McDonnell in the X30 Junior class. McDonnell simply blew away the opposition in both finals, blazing a trail that wasn’t event warm when his rivals crossed the line. In the X30 Senior class, things were a little more hard fought and it was Garry Edwards who took home to silverware. That just left the 125 Open and KZ2 finals to run and these gearbox karts provided a thrilling climax to the days racing as the sun eventually began to break through the clouds. Bantry man Joe Crowley took a popular win in the 125 Open final while the KZ2 final saw a brilliant three way battle all the way to the line with Bill Sherlock leading home Shane Crosbie and Ritchie Faulkner in one of the races of the day. Belgian Assistant Clerk of the Course Kris Lambrecht was a welcome visitor at the days proceedings. The ninth and final round of the championship will take place on the September 27th in Tynagh, Co. Galway. The Tyrone/Kerry pairing of Kris Meeke and Paul Nagle brought their works Citroen DS3 home in third place in the Australian round of the World Rally Championship, having led the rally for seven of its seventeen stages. The all-conquering VW Polos of defending World champion Sebastien Ogier and Jari-Matti Latvala took the top two positions, with the Irish pair just 32 seconds behind the winners after three days, leaving Meeke sixth in the WRC points table.